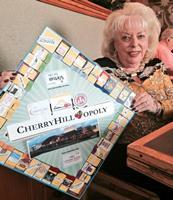 The Cherry Hill Education Foundation, along with Cherry Hill Mayor Chuck Cahn and Superintendent of Schools Dr. Maureen Reusche, is pleased to announce the creation of “Cherry Hill-opoly” – a new board game that showcases Cherry Hill Township and the Cherry Hill Public Schools in the traditional Monopoly® format that we all know and love. The Cherry Hill Education Foundation is a 501(c)3 non-profit all-volunteer organization whose mission is to raise funds for the Cherry Hill Public Schools. Proceeds from the sale of the game will be used by the Foundation to fund grants in the Cherry Hill Public Schools. Teachers from our 19 schools submit grant applications every year seeking funds for creative programs and projects for their classroom, their grade level, or for their entire school. Games are available for $40 each through the Cherry Hill Education Foundation website, at the Municipal Building (820 Mercer St.), at the Cherry Hill Public Library (1100 N. Kings Highway) or through your school’s PTA. Five dollars from each game sold through the PTA and the Library will benefit those organizations, as well. Oct. 15 was the deadline for holiday pre-orders, but the Education Foundation is still accepting orders for deliver after the December holidays! For more information or questions, visit the Cherry Hill Education Foundation online at www.cherryhilleducationfoundation.com, or call (856) 428-7585. Learn more about Cherry Hill-opoly! ⇐Previous Cherry Hill receives Planning Award for LourdesCare projectNext⇒ Tips and recommendations for a safe, happy Halloween!